Power management company Eaton today announced the arrival of the new Eaton AFDD+, an arc fault detection device that provides critical all-in-one protection against electrical fires in homes and buildings. “Often hidden and hard to detect manually, arc faults can be caused by repeatedly pulling out cables by the cord, the crushing of trapped cables or even pet and rodent damage. Without detection, arc faults can cause a build up of carbon which can easily ignite and potentially result in an extremely costly or deadly fire,” said ANZ Eaton general manager of power distribution Dan Agnew. 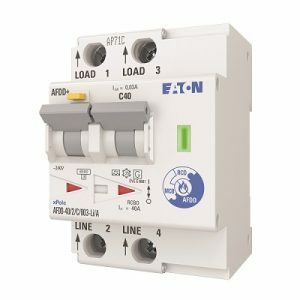 Already widely used in Europe and the United States, the Eaton AFDD+ is the first IEC based solution in the world to combine all three protective layers in one device. The AS/NZS 3000 Electrical Installations (Wiring Rules) standard published guidelines for use of arc fault detection devices in final subcircuits for locations storing flammable materials, fire propagating structures, premises with sleeping accommodation or buildings where valuable assets need to be protected. The Eaton AFDD+ comes in multiple options ranging from 10A to 40A, with in-built 30mA Type A RCD. Devices come with a purpose-designed busbar comb for easy installation. The Eaton AFDD+ is available now through leading electrical wholesalers across Australia.